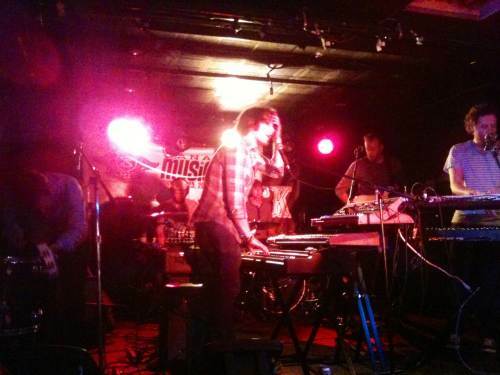 On Saturday, I headed over to the Hard Luck Bar to catch Winnipeg’s Royal Canoe. I went in knowing that they had a really groovy and weird new EP called “Extended Play,” but just a couple songs in, I was absolutely blown away. With six members all completely focused on many different things but still showing that they were into the audience and feeling the music, it was impressive to watch them all so in sync with each other, even when their guitarist was having some mic troubles. Everyone kept commenting on how much gear they had, and how it must be to travel across the country with it. With two, sometimes three drummers, three sets of keyboards or synths to two other members plus a couple guitars and a bass, it was a full stage. Matt Peters and Matt Schellenberg take most vocal duties, but the others all chime in throughout the songs, showing that they know when to have solo and group voices, and it adds a whole other layer to their work, especially when one guy goes low and another guy goes high. When you think about it all, it sounds like it shouldn’t work, there’s so much going on, but all the puzzle pieces now fit together for Royal Canoe to sound enchantingly strange, quirky and headed in a direction that will give Canadian rock music a new edge. If you missed this set, be sure to check them out when they’re back in May at the Garrison. Toronto’s Papermaps took the stage after them. With new member Betty Dimo who proved to be a strong yet appearing behind-the-scenes backbone to the group, they used most of their set to premiere new material. But they weren’t short of the hits from their self-titled album (“woooo, old songs!” yelled guitarist Todd Harrison) like the pop rock radio-friendly anthem “Reunion” as well as “Complicate Things,” “Can’t Make a Living” and “You Are My Gallows.” Papermaps played with a lot of gusto and seemed genuinely happy to play there and then, which always makes the audience comfortable. They ended their set on a fun note, bringing up tons of friends on stage for a song to sing and play tambourine to. 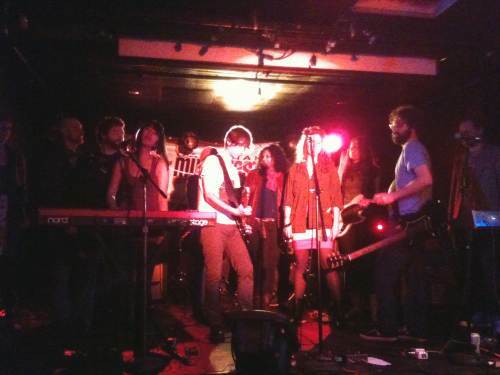 After their set, I power walked over to the Garrison for ALX, the new incarnation of Allie Hughes’ band. The five-piece fronted by the theatrical singer who used to perform marriages and proms as her set have re-worked her older songs into more synth-based, drum-driven dance songs. After she had released her new song “I Will Love You More” a couple weeks ago, I was looking forward to more material like that, but it’s yet to come. But this was only their second set after as a new entity, so there’s much to look forward to as they figure out the new path. Many kudos to Hughes for being so graceful about the computer’s synth track turning off during that single at the end of her set. I know each of the band members — who also included Maddy Wilde (of Moon King/ex-Spiral Beach) and Kelly McMichael (of Rouge)– have enormous talent, so I’m interested to see what they come up with next.